In his book Sculpting in Time, Tarkovsky notes: "The idea of "montage cinema" -- that editing brings together two concepts and thus engenders a new, third one -- again seems to me to be incompatible with the nature of cinema. Art can never have the interplay of concepts as its ultimate goal. The image is tied to the concrete and the material, yet reaches out along mysterious paths to regions beyond the spirit..."
Andrey Tarkovsky entered school in Moscow in 1945, and nine years later enrolled at the State Institute of Cinematography. He displayed a remarkable talent with his first feature, Ivan's Childhood, in 1962 and he continued to astound for over twenty years. He announced his self-imposed exile from the USSR in 1984, just two years before his death. His memory has since been venerated in his home country, and his reputation and stature continue to grow throughout the world. 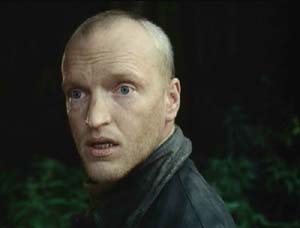 The Stalker is half-outlaw, half-saint; he guides those who want to enter the forbidden Zone, seeking an answer to their deepest desires, while hoping to heal his own sick daughter: But the Zone plays strange tricks on those who dare to enter � and Tarkovsky here creates his most disturbing vision of a dislocated world. "'We do not move in one direction, rather do we wander back and forth, turning now this way and now that. We go back on our own tracks . . .' That thought of Montaigne's reminds me about something I thought of in connection with flying saucers, humanoids, and the remains of unbelievably advanced technology found in some ancient ruins. They write about aliens, but I think that in these phenomena we are in fact confronting ourselves; that is our future, our descendants who are actually traveling in time." I am glad that the old page is lost. It must be a different analysis all together! The PM approach, the only way not to be descriptive. "The image becomes authentically cinematic when [...] not only does it live within time, but time also lives within it, even within each separate frame." (Tarkovsky, p. 68). The Concept (Reflections), Amarcord by Fellini (8 1/2), Memories and Dreams (Kurosawa), Time ("Duration" by Bergson) an Mortals. Self-Analysis, Self-Knowledge, Reflections, Doubling, The Inner Reality (mindscape). Associations (composition, logic). From the Concept to Composition. * Identification (Tarkovsky and I). My favorite segment (the idea of segmentation is introduced, breakdown), my favorite shot (analysis). Aristotle (#3 -- The Idea, or Message) and the communication basic model (sender - code - receiver). From appreciation to expression (about directing and classes to take). "Sculpturing in Time" (thinking in images and visual storytelling) Books to read... What do you need to become a film director? Research and preparation (pre-production = every second of your life). The skills you need. Screen and "Being as Becoming" (personal philosophy). Donato Totaro Art For All 'Time': Andrey Tarkovsky _Sculpting in Time: Reflections on the Cinema_ Translated by Kitty Hunter-Blair Austin: University of Texas Press, 1996 ISBN: 0-292-77624-1 255 pp. ... 'The aim of art is to prepare a person for death, to plough and harrow his soul, rendering it capable of turning to good' (43). * Editing still plays an important part in Tarkovsky's aesthetics but its creativity comes from matching the varying time-pressures already established in each shot and not from clever or conceptual juxtapositioning. For example, in _Mirror_, his most complex film structurally, Tarkovsky combines historical and personal time by intercutting childhood memory and political and cultural history: the Spanish Civil War, Russia-Germany in WW2, the Cultural Revolution, the atomic bomb. But the editing carefully fuses these varying time capsules by matching the rhythm of the stock shots to the rhythm of the filmed shots. To such convincing effect that many people believed the stock footage of Soviet foot soldiers crossing Lake Sivash was filmed by Tarkovsky. * Art movies are those non-commercial movies for the sake of arts. "Take The Mirror, a very autobiographical film. The life of its main character, the author's second "self," and the chronology of the narration fit in the time line of our society, from the Hindenburg disaster in the early 1930s, public demonstrations welcoming pilots back from their rescue missions in the Arctic, the civil war in Spain in 1936 to 1939, the conflict over the Chinese Island of Damansky and so on. In the film this historical line runs in close parallel with deeply intimate events, a time line of the author's own life, his own story. A blend of "macrocosm" and "microcosm", the general background of worldwide historical events unfolding on the screen and the camera obscura of fine psychological undercurrents and soul-searching, was another secret and singularity of Andrei Tarkovsky's cinematic art. So it is very important to be familiar with some of the less publicized sides of his life, his family and roots to understand the message of his films. With great tact, without a hint at self-exposure, which is so in vogue these days, Tarkovsky put his own life and the images of his relations on the screen." "Но картина �Белый, белый день�� должна быть � более всех остальных � независима от других искусств. Мне хочется добиться выражения своих мыслей чисто кинематографическими, почти беспримесными средствами." Tarkovsky. ... Теоретики кино часто рассуждают о том, что кино � это равноправное искусство в сопоставлении с той же литературой. Но достаточно сравнить имена Пушкина, Томаса Манна или Достоевского с именами самых крупных кинорежиссеров, как становится ясной несоизмеримость такого сравнения. ... �Какое счастье оказаться во времени, когда нас не было, когда еще все было возможно�. 2008 : Mirror is last before final paper cycle. The idea for The Sacrifice came to me long before I thought of Nostalgia. The first notes and sketches, the first frenzied lines, date back to the time when I still lived in the Soviet Union. The focal Point was to be the story of how the hero, Alexander, was to be cured of a fatal disease as a result of a night spent in bed with a witch. Ever since those early days and all through the time I was working on the screenplay, I was constantly preoccupied with the idea of equilibrium, of sacrifice, of the sacrificial act, the yang and yin of personality; it became part of my very being, and all I have experienced since living in the West has served only to make that preoccupation more intense. I have to say that my basic convictions have not changed since I arrived here; they have developed, deepened, become firmer, there have been changes of interval, of proportion. So, too, as the plan of my film gradually evolved, it kept changing shape, but I hope that its central idea remained intact. What moved me was the theme of the harmony which is born only of sacrifice, the twofold dependence of love. It's not a question of mutual love: what nobody seems to understand is that love can only be one-sided, that no other love exists, that in any other form it is not love. If it involves less than total giving, it is not love, It is impotent, for the moment, it is nothing. I am interested above all in the character who is capable of sacrificing himself and his way of life-regardless of whether that sacrifice is made in the name of spiritual values, or for the sake of someone else, or of his own salvation, or of all these things together. Such behaviour precludes, by its very nature, all of those selfish interests that make up a 'normal' rationale for action; it refutes the laws of a materialistic worldview. It is often absurd and unpractical. And yet---or indeed for that very reason-the man who acts in this way brings about fundamental changes in people's lives and in the course of history. The space he lives in becomes a rare, distinctive point of contrast to the empirical concepts of our experience, an area where reality-I would say-is all the more strongly present. Little by little that awareness led me to carry out my wish to make a feature film about a man whose dependence upon others brings him to independence and for whom love is at once ultimate thrall and ultimate freedom. And the more clearly I discerned the stamp of materialism on the face of our planet (irrespective of whether I was observing the West or the East), came up against unhappy people, saw the victims of psychoses symptomatic of an inability or unwillingness to see why life had lost all delight and all value, why it had become oppressive, the more committed I felt to this film as the most important thing in my life. It seems to me that the individual today stands at a crossroads, faced with the choice of whether to pursue the existence of a blind consumer, subject to the implacable march of new technology and the endless multiplication of material goods, or to seek out a way that will lead to spiritual responsibility, a way that ultimately might mean not only his personal salvation but also the saving of society at large; in other words, to turn to God. He has to resolve this dilemma for himself, for only he can discover his own sane spiritual life. Resolving it may take him closer to the state in which he can be responsible for society. That is the step which becomes a sacrifice, in the Christian sense of self-sacrifice. Again we are reminded of the dictum that our life here on earth was made for happiness, and that nothing else is more important for man. And though this could be true only if one were to alter the meaning of the word happiness-which is impossible-neither in the West nor in the East (I am not referring to the Far East) will a dissenting voice be taken seriously by the materialistic majority. I posit that modern man, for the most part, is not prepared to deny himself and his interests for the sake of other people or in the name of what is Greater, of what is Supreme; he will more readily exchange his own life for the existence of a robot. I recognise that the idea of sacrifice, the Christian ideal of love of neighbour, enjoys no popularity - and that nobody asks us for self-sacrifice. It's regarded as idealistic and unpractical. But the results of our way of life, of our behaviour, are plain enough: the erosion of individuality by overt egoism; the degeneration of human bonds into meaningless relationships between groups; and, still more alarming, the loss of all possibility of returning to that higher form of spiritual life which alone is worthy of mankind and which represents man's one hope for salvation. An example will illustrate what I mean about the prime importance accorded to material interests. Physical hunger can be alleviated fairly simply by means of money; today we tend to use the same simplistically Marxian 'money = goods' formula in our efforts to escape from mental deprivation. When we feel inexplicable symptoms of anxiety, depression or despair, we promptly turn to the services of the psychiatrist or, better still, sexologist, who has taken over for the confessor and who, we imagine, calms our minds and restores them to normality. Reassured, we pay him at the going rate. Or if we feel a need for love, we go off to a brothel and again pay in cash-not that it necessarily has to be a brothel - And all this despite the fact that we know perfectly well that neither love nor peace of mind can be bought with any currency. The Sacrifice is a parable. The significant events it contains can be interpreted in more than one way. The first version was entitled The Witch, and it told the story of the hero's amazing cure from cancer. His family doctor having told him that his days were numbered, Alexander answered the door one day and was confronted by a soothsayer-the forerunner of Otto in the final version-Who gave Alexander a strange, almost absurd instruction: he was to make his way to a woman reputed to be a witch and spend the night with her. The sick man obeyed as his only way out and, through God's mercy, was cured; this was confirmed by the astonished doctor. And then one wretched, stormy night, the witch appeared at Alexander's house, and at her bidding he happily left his splendid mansion and respected life and went off with her with nothing but the old coat on his back. In overall effect this was to be not only a parable about sacrifice but also the story of how one individual is saved. And what I hope is that Alexander-like the hero of the film finally made in Sweden in 1985-was healed in a more significant sense: it was not only a question of being cured of a physical (and, moreover, fatal) disease; it was also a question of spiritual regeneration, expressed in the image of a woman. Curiously, while the images of the film were being conceived, and indeed all the time the first version of the scenario was being written, regardless of the current circumstances in my life the characters began to stand out more and more clearly and the action grew steadily more specific and structured. It was almost an independent process that entered my life of itself. Furthermore, while I was still making Nostalgia I could not escape the feeling that the film was influencing my life. In the Nostalgia scenario, Gorchakov had come to Italy for only a short time; but he fell ill and died there. In other words, he, failed to return to Russia not of his own volition but because of a dictate of fate. I also did not imagine that, after finishing Nostalgia, I would remain in Italy; but, like Gorchakov, I am subject to a Higher Will. Another sad fact came to underline these thoughts: the death of Anatolly Solonitsyn, who had played the lead in all my previous films and who, I assumed, would have the parts of Corchakov in Nostalgia and of Alexander in The Sacrifice. He died of the illness of which Alexander was cured and which a year later, was to afflict me. I don't know what this means. I only know that it is very frightening, and I have no doubt that the poetry of the film is going to become a specific reality, that the truth it touches will materialise, will make itself known, and-whether I like it or not-will affect my life. There can be no question o a person's remaining passive once he has grasped truths of that order, for they come to him without his willing it, and they overturn all his earlier ideas about how the world is. In a very real sense he is divided, aware of being answerable for others; he is an instrument, a medium, obliged to live and to act for the sake of other people. At a place where two paths crossed. Like eyes of an eagle scared. And growth of valley vine. With his incamadine right hand. A coal alive with flames. To fire men's hearts with the word. Tarkovsky talks about "Mirror" an interview : "Zerkalo or as it is by its English title Mirror (1975) is, the fourth of Tarkovsky's seven films, and is "central" both numerically and aesthetically to his oeuvre. 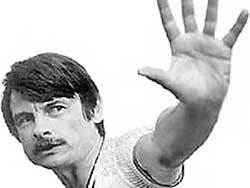 By Tarkovsky's own account, his most openly autobiographical, daring, and self-revealing film. "What, in my view, is Mirror about?"